Green, vibrant and lush—all these describe Abhijun’s village of Lhepar, an agrarian community in Asia nestled among rolling hills and mountains. The surrounding knolls, covered in verdant and sprawling vegetation, frame the picturesque landscape. Abhijun, 21, and his fellow villagers lived in near-perfect harmony. But underneath the beauty, the fertile lands hid a dangerous secret. As a complete opposite to the abundant environment, the village’s primary water source was anything but perfect. Dirty and murky, the local well posed a serious threat to Abhijun and the locals. The young man and his family members each had, at one point or another, fallen ill from typhoid or diarrhea. These, along with malaria, were among the many threats present in the village’s water. Several previous attempts had been made to dig new wells, but they all proved to be just as contaminated. 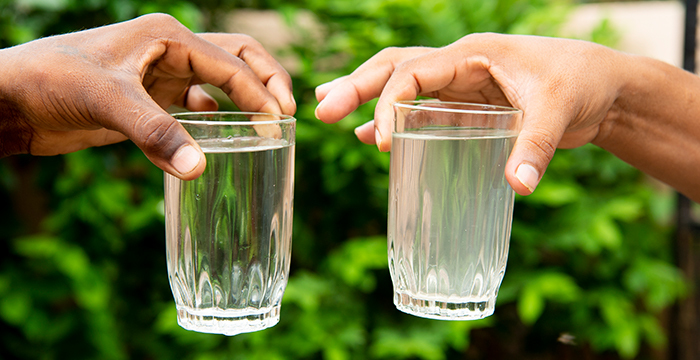 This lack of clean water is a recurring theme in many developing countries worldwide. Currently, 2.1 billion people live in water-stressed areas—areas that have no safely managed water services.1 According to the World Health Organization (WHO), half the world’s population will live in water-stressed areas by 2025.2 The United Nations projects the world’s population will reach 8.1 billion in 2025,3 so roughly 4 billion men, women and children will live where water is scarce or unsafe. Around the world, children and women often walk long distances to collect drinking water at contaminated wells and stagnant ponds, contracting deadly waterborne diseases. Death and sickness were two things Abhijun was familiar with. Including him and his family, many in his village and the surrounding area contracted serious illnesses such as typhoid from their drinking water. 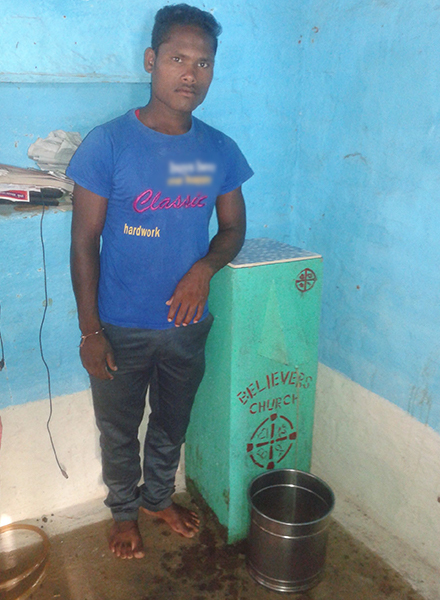 GFA is working toward the improvement of situations like Abhijun’s with its two major clean-water initiatives: Jesus Wells and BioSand water filters. In places where the water sources are almost completely contaminated, such as Lhepar, BioSand water filters are the best option. Abhijun, pictured here with his BioSand water filter, now has pure water to drink. For Abhijun and his family, a BioSand water filter, which purifies water up to 98 percent, was the perfect solution to their water crisis. Fortunately for them, GFA-supported worker Balash, who leads the local BioSand water filter program, happened to be in their area. During his visit, Balash saw the water quality. Horrified, Balash asked the local GFA-supported pastor, Rajsari, if this was the condition of the water in the surrounding area. Pastor Rajasri confirmed this, adding that the water in surrounding villages was significantly worse. The GFA-supported worker immediately went to work, building the filters and distributing them to the thirsty villagers. When water is accessable but dangerous to drink, BioSand water filters enable a family to purify dirty water, making it drinkable and safe to use. These filers make water 98% pure and last up to 20 years. When Balash finished, 150 families in total, including Abhijun’s, were blessed with BioSand water filters! 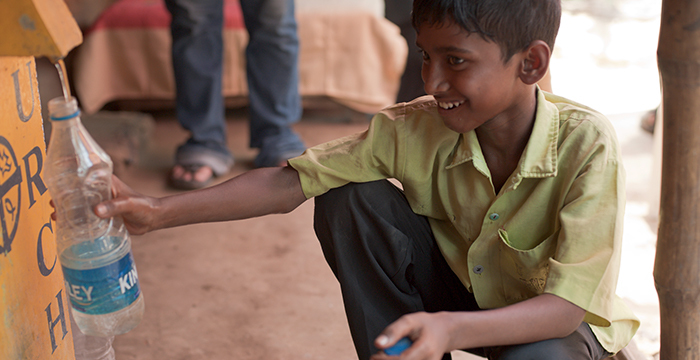 Not only does Abhijun enjoy clean water, but his neighbors do as well. They come over to collect water for themselves and for their relatives. Abhijun’s relatives also no longer worry about the water. Clean water can literally save lives. Not only is people's health greatly improved, but with safe water, women can spend less time gathering water and children can spend more time going to school. There are millions more with stories like Abhijun’s. 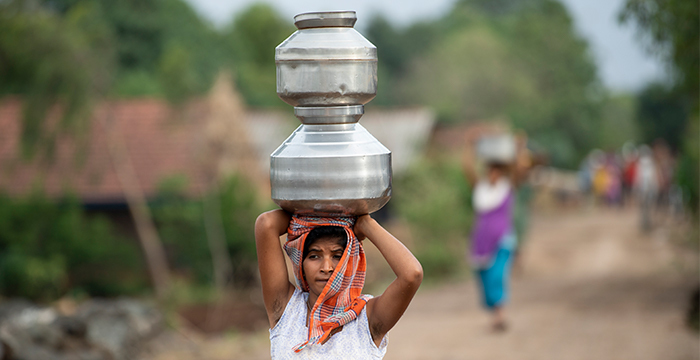 You can help provide a BioSand water filter to a thirsty family in Asia. Not only will you give them clean water for many years, but you’ll also provide them with the opportunity to hear of the Living Water.